UPDATE: This review was done in September 2015 and my conclusion was to ‘wait for the first bug fix release to get a more stable product.‘ It’s now four months later. We are up to Dragon version 5.0.4, and based on my own experience and the comments of people below, it’s not getting any better. In fact it’s now become so unstable under ‘El Capitan’ that I’ve had to stop using it. I have gone back to using the built-in dictation, which is pretty painful, but at least it doesn’t crash! The most obvious difference is that the Dragon Dictate Application seems to have completely disappeared as an app and it has more or less integrated itself into the operating system. This is fantastic. It doesn’t feel like Dragon is now a clunky add on application – it feels like part of OS X itself. If you have the status window hidden, the only way you know Dragon for Mac is running is that it appears in a small menu icon at the top right of your screen. You can access the Dragon menu commands from whatever app you happen to be in. It feels more integrated into other applications than the previous version of Dragon. You can be dictating into Apple Pages and access the Dragon menu to do ‘vocabulary training’ or ‘microphone setup’ without switching apps. The new Dragon menu is available from any application you are in. There is no longer a separate ‘note pad’ application to dictate into, rather Nuance have designed Dragon to dictate into any app. Now they haven’t fully pulled this off yet – see the comments below under ‘integration into applications’ – but this is certainly a step in the right direction. Dragon for Mac looks a lot prettier. If you say ’show status window’ (or select it from the Dragon menu) the new status window appears. It’s is a huge improvement on the old one. Instead of being that ugly black colour from the 1980s, the status window has been redesigned with the OSX and iOS 8 look and feel. For example here are some pictures of the status window. As well as giving you a volume level it displays tips of what you can say. These tips are really useful, especially for new users to Dragon, although I’ve been using it for years and I still found them useful. The suggestions vary depending on the context – where your cursor is. The new status window in ‘dictation’ mode. The status window with some text selected. The status window with the microphone off. The speech recognition accuracy seems fairly similar to what it was in Dragon 4 (I was running Dragon 4 with the ‘accuracy’ set to maximum.) Dragon claim an accuracy improvement of 15%. That might be true but it’s hard to notice. I imported my old speech profile across to Dragon for Mac and the amount of mistakes that are being made doesn’t seem to have changed significantly. I’m not coming away thinking ‘wow, this is a huge improvement in the speech recognition accuracy.’ I am coming away with a big wow in terms of the ability to dictate without any training – more about that later. The lack of noticeable improvement in accuracy is more than made up for in the speed improvement. The speed at which the speed recognition is done is incredible! The text appears almost instantaneously the moment you stop speaking. In Dragon Dictate version 4 there was a noticeable lag between the end of your sentence and when the text was pasted into the application. In version 4 there was also a setting for you to choose between ‘accuracy’ and ‘ speed.’ There was a trade-off between the two. Running at the ‘accurate’ end of the spectrum, I found Dragon Dictate slightly too slow, whereas running at the ‘speed’ end of the spectrum I found that Dragon Dictate made too many mistakes. That setting has disappeared and the new Dragon for Mac seems to be running at full speed and full accuracy. So overall there is a noticeable improvement in performance. For the first time ever, you can now use Dragon without any training at all! In every previous version of Dragon Dictate you had to spend 5 to 10 minutes in front of the computer reading to it so that it could learn to adapt to your voice. This might not be an unreasonable investment given the time that you will save in using Dragon, but it is a bit of a downer when you first receive the software to have to sit through all the training. 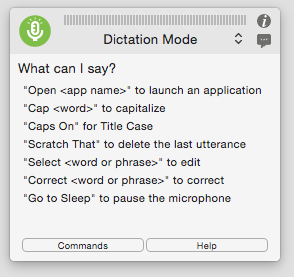 Remarkably, Dragon for Mac recognises your speech very accurately with no training at all. I dictated the second half of this article right in an untrained profile of Dragon for Mac and it was very usable straight out of the box with no voice training! There is an option for extra ‘Voice Training’ if you want to improve the accuracy. Sadly there are way too many issues with Dragon for Mac. It’s almost like a beta testing version. If buggy software annoys you it’s probably worth waiting for the next minor upgrade date before you upgrade. Once Dragon for Mac is running, the speech recognition is fast, but the application itself is terribly slow to install and to load. When Dragon for Mac is launched there is a message “Dragon is Starting up…’ and Dragon for Mac takes about 30 seconds to load. Most of my other apps take 1-2 seconds to launch. My MacMini takes 15 seconds for the entire boot process. So it takes twice as long to load Dragon as it does to boot my entire OS X. During installation there were lots of spinning beach balls with no indication as to whether my computer had crashed or was still doing something. The first problem I encountered, and I have to admit it was a pretty major one, is that when I did have a go at ‘voice training’ (I couldn’t help myself) Dragon for Mac crashed about 5 minutes into the process, losing all of the training I had done. Even when it goes smoothly, training is a pain in the neck – sitting at your computer reading monotonous passages – it’s worse when it crashes! I didn’t bother retraining to see if the accuracy improved. Dragon for Mac is designed to dictate into any application, so that you do not need a separate app like ‘Notepad’. You cannot mix typing and speaking in any app – Dragon gets confused. 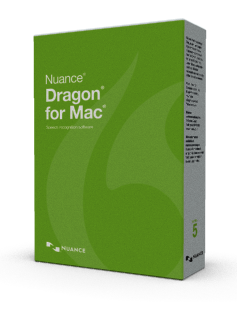 But Nuance claim that Dragon has been designed to work especially well Microsoft Word and Text Edit. I don’t have Microsoft Word, I use Apple’s pages. It seems a strange choice that Dragon would choose to integrate with Microsoft Word, but not with Apple Pages. Full integration with Apple Mail would have been nice too. So what does this full integration mean? With Microsoft Word and Text Edit you can ‘mix’ dictation and typing. You can type some text, and then you can say ‘select word‘ and Dragon will go back and selected the word that you typed. Or you can say ‘ insert before word‘ and Dragon for Mac will go back and start dictating from before that word ( even if you typed that word rather than dictated it). This feature is only available from within Word and Text Edit. You can’t do that in Apple pages or Apple mail. In any other app other than Word and Text Edit, you can only use ‘select word‘ with words that you have dictated. Dragon not work with the latest Office 2016. I think this is a problem with Microsoft Word rather than Dictate because the OS-X dictate does not work in the new Microsoft Word either. Problems with capitalisation and dropping the last letter of a word. These problems carry over from Version 4. Using Text Edit (the only piece of software that I have that you can mix your ‘speaking’ and ‘typing’ with) Dragon seems to still have some problems capitalising the first word in a sentence when you are mixing speaking and typing. For example when I typed a full stop (period) at the end of a line, and then said ‘new line’ and started dictating, Dragon began the next sentence with a lowercase letter instead of an uppercase one. There are also times when I found myself clicking in the middle of a sentence to add a word and dictate would capitalise that, even though it was in the middle of a sentence. There are a few times I have just clicked at the end of a sentence and started dictating and Dragon doesn’t capitalise the first letter of the sentence there either. So it seems to have trouble working out the context of a single word within a sentence in terms of whether to capitalise it or not. Apple dictation on my iPhone doesn’t seem to have any problem getting this right. It looks back at how the last word ended and works out whether it should be beginning with a capital letter or not. This might sound like I am being picky but by version 5 Nuance should have something as simple as capitalisation working. In Dragon Dictate version 4 there was the dreaded dropping the last letter of the word bug, where you would click after a word, start dictating, and Dragon Dictate would remove the last letter of the previous word, drop in your dictated text, and then stick the orphaned letter at the end of the sentence. This has happened to me a number of times with Dragon for Mac, so there are still a few issues to iron out. Finally, Dragon for Mac seems to add a space before every word that you dictate. Sometimes this is desirable, but not all the time, the problem is that Dragon for Mac always adds a space. So if you click into a sentence and you click straight before a word (after a space), and start dictating, you get a double space before the word, and then no space after the word. This was also the case with Dragon Dictate. I think this is what Nuance mean when they say that ‘dictating’ mixed with ‘typing’ doesn’t work in applications other than Microsoft Word and Text Edit. It will be nice when this happens in all applications. There are lots of little bugs. Some advanced features are not working. I can’t edit Applescripts. I can’t add keyboard shortcuts. I can’t add Menu Commands. If you look on the forums there are a few other teething issues. It seems this is a fairly major overhaul that is more than skin deep and this has led to some problems that were not there in previous versions. I assume these will be sorted out fairly soon. This is the most significant upgrade to Dragon since Dragon Dictate was released. In this previous review of version 4 I said that I did not think it was worth the upgrade from 3 to 4. I thought it was rude of Nuance to charge such a hefty upgrade fee ($149) to it’s loyal users for such a lame offering. Well for those of you who decided to wait, todays upgrade to ‘Dragon for Mac’ is the upgrade you were waiting for. Dragon for Mac has been given a facelift as well as a good boost under the hood. Upgrading to Dragon for Mac is a no brainer – conceptually it’s the best Dragon we’ve had. If you are desperate I would go for version 5.0 and start enjoying the new features now, but it might be better to wait for the first bug fix release to get a more stable product. You can buy it direct from Nuance from here (affiliate link). If you buy it direct from Nuance you get the 30 day money back guarantee. But if you are going to buy it read here for the interesting price differences. On Nuances own store the price (for the upgrade) varies from $99 to $150. I too suffered constant Word crashes on two different systems (a MacBook Pro running office 2011 and a Mac Mini running office 2016). Using Pages suffers issues with accuracy and spurious spaces appearing in the text. However, Dragon appears to work flawlessly on my Apple computers with Open Office. Seriously, the download was about three minutes, the install was less than 10 seconds, and the OO interface is a vast improvement on what I saw just five years ago. In, short if you have purchased this expensive software and it is languishing on your hard drive, try installing Open Office. Your input is provocative in that I have tried so many times over the years to use Dragon on the Mac and met with so much frustration. I have used OpenOffice on the Mac and currently use NeoOffice which is said to be the preferred app for Mac users. For me, NeoOffice and its correlate to “Word” which is called “Writer” is superior to Word in many ways. Note, however, that I am a medical professional so my use of Writer has particular functions that make it superior to Word. For me, the price of the app is not an issue but the functionality and utility of the app makes a world of difference. So the bottom line is that what works well in OpenOffice should work well in NeoOffice. Note that NeoOffice can be purchased via the AppStore for $39 or from the NeoOffice website for a donation (I think it is a minimum of $10). Note also that In my experience the support from the developer of NeoOffice has been crappy. This guy has a real chip on his shoulder and he reminds me of the soup kitchen “nazi” on Seinfeld. If your tech question offends him in any way he will reply in an ugly manner or not reply at all. With all of this said, I have had very few issues with NeoOffice & I would consider it one of my most important apps. I am using El Capitan on a new iMac. The real issue for me is to I try Dragon Dictate again as per Kevin’s experience with OpenOffice or do I leave well enough alone. I do not know. Undecided for now. I did not consider NeoOffice, but will try it, thanks! It is laughable that we should have to consider and recommend alternatives to the industry gold standard, particularly after so many years of development – how long has word been crashing when using Dragon now? V 6 is released tomorrow but ominously, no details on compatibility with Microsoft Word for Mac. It would be beyond comprehension if this major problem was not addressed. I doubt anything will change, their advertising copy describes all kinds of improvements, with the exception of stability – the only improvement that would prompt me to pay out again. I am amazes at this. 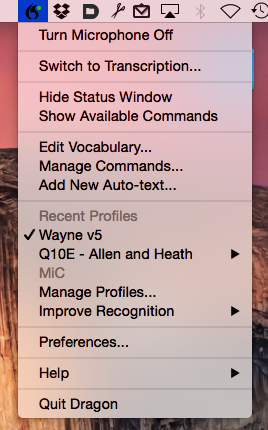 In good faith and at the explicit advice that the new 6 version would be compatible with Word 2016, I upgraded. A similar experience to David; constant crashes. The difference between the Mac and Windows versions of Dragon could not be more stark. Windows is brilliant, Mac is a disaster. I will definitely not trust any further versions until I am certain this will be fixed. As a postscript; my Windows desktop PC has just died after 4 years and I was seriously considering replacing with a new iMac. The sole reason for not doing so is that I will not be able to use Dragon with it. For those of you who were commenting last summer and fall (in 2016), how is Dragon for Mac on Sierra? Does it now work easily – and without crashing? I am astounded Nuance still has not implemented a porting of DNS into Mac OSX after all these years. They appear be continuing their long-standing commitment to the current iterations of the Mac Dictate app, which has never been the equal of DNS on the PC. I run DNS 13 with DragonPad in a Parallels Desktop emulation of Windows 10 on my MacBook Pro and cut & paste into Word for Mac. While this is a clunky work-around it works easily, with high accuracy, and without crashing. Still waiting for Nuance to recognize that those of us with Macs do compare the Mac product with DNS for the PC, and that we are still waiting for them to make good on their marketing rhetoric for the Mac. I long ago stopped holding my breath this was going to happen anytime soon. No if anything it’s now worse. I’m doing some tests to try and work out which is the most stable version.